Chris and Leandra went to Yakima Washington to see where 77% of the country's hops are grown (two thirds of which are exported to brewers all over the world). As aspiring hop farmers, there were three main reasons we made the decision to take a trip out west. We wanted to learn how & when to harvest and process our hops, see how a full scale, state of the art hop farm looks like and operates during hop harvest, and to make connections and meet experts (these guys have been growing hops for generations). We accomplished all three. Seeing awesome western american roadside geology was a bonus. 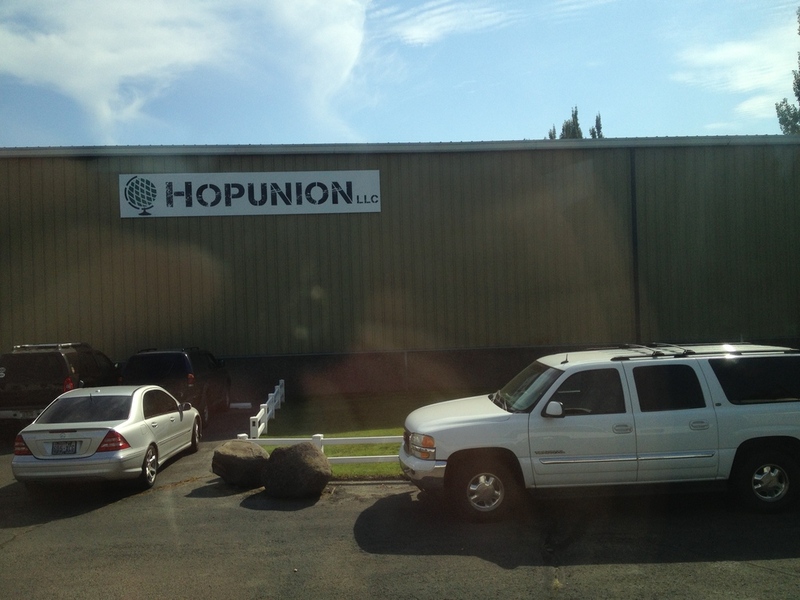 Hopunion as seen from our bus to the hop yards. We went to hopunion's hop & brew school, a two day event where from 8 to 5 there are seminars and trips to hop farms where we learn how hops are grown & processed. When we arrived, there were coolers and coolers full of craft beers, donated by brewers from all over the country. Amazing beers we had never been able to drink before: Coronado Brewing company, Marble IPA, Ice Harbor, Myrcenary double IPA (Odell), Pliny the Elder & Row 2 hill 56 (Russian River), plenty of New Belgium (we're by the east coast after all), and Elevated by La Cumbre. The coolers persisted during the entire 2 day event. They came out at 8 am and were out when we got a free shuttle ride home to our hotels at 5 pm. They came with us on the buses to the hop farms. One of the many legendary beer coolers. The seminars were awesome! We sat next to Stan Hieronymus (his book For the Love of Hops is in our collection) before he gave a talk on the state of hops in the world and how the German polaris was breaking oil content records for the 2013 harvest. Vinny Cilurzo of Russian River gave a talk on how to brew with experimental hops while we sipped two separate beers he created with two different varieties of experimental hops (one of which he brewed on a 5 gallon brew system!). Vinnie Cilurzo, owner of Russian River talks about brewing with experimental hops. We spent one night after class at the Sportsman's pub in downtown Yakima. Some of the country's best brewers were there, also in town for Hops & Brew School. There we spoke with the owner of yakimavalleyhops.com for at least an hour. After learning our dreams & aspirations he told us that he would be a resource for us. It was so encouraging to meet people that have the same passion as us willing to help us and share their experience. To be honest, we haven't had the same experience here on the east coast. We had Topcutter IPA by Bale Breakers at the Sportsman pub. We had the privilege of walking through Jason Perrault's experimental hop yard. Jason is responsible for Simcoe, Mosaic, and Citra varieties. There were 8,000 different varieties, one plant each. None of which are available yet for purchase. It was amazing to walk through a hop yard knowing the next great hop varieties were likely growing right there. We were given free reign. We walked through the plants, ripping off cones and rubbing and smelling the resin. Jason was with us, explaining the complexity of breeding new commercial hop varieties. Hundreds of thousands of hop crosses are germinated, only to have 99.5% thrown away due to virus & fungus susceptibility right off the bat. Then a select few are subject to extensive testing for 5-10 years before we can get our hands on a new commercial variety. These coolers went everywhere with us. Here, they're loading coolers full of beer onto the buses on our way to the hop farm. Walking through Jason Perrault's experimental hop yard. This is a section that will likely be a new commercial variety in the next 2-3 years. All in all it was a great experience. We met wonderful people, learned a ton about hops, saw awesome geology, and most importantly, we saw a future for us. This is what we want to do. No matter how much we hear that growing hops is one of the hardest things you can do, we still want to do it 100%. This is our calling. We're in it for the long haul. We would like to give a big thanks to the folks at Hopunion. Hop and brew school was an amazing experience and we have recommended it to brewers & home brewers alike. We look forward to attending again next year!